My propositions for the "Grand Debat National" - in French! I've finally got round to sending some of my propositions to the website set up by the French government for the "Grand Debat National". It's actually quite well done. There are four different themes where individuals can make propositions. The first concerns the "Transition Ecologique" (Ecological Transition)- where there are currently over 59,000 contributions from over 49,000 different participants. The third concrns "Democratie et citoyenneté" (Democracy and Citizenship). It's had over 45,000 contributions from over 37,000 participants. The final section concerns "Organisation de l'Etat et des services publics" (Organisation of the state and public services) and it's had over 47,000 propoals from nearly 39,000 participants. That's quite impressive - over 231,000 different proposals to go through. And there's still another 30 days to go before the deadline. Un Revenu de Base Inconditionnel couplé avec une réforme complète du système de taxation. Un pécule pour tout jeune dès le jour de ses 18 ans. But if Emmanuel Macron really wanted to prove that he was on the side of the French Citizens, and not playing for the super rich and the investment bankers who he used to work for (he worked for Rothschilds for four years starting in September 2008, and was a Bildeberg meeting attendee in 2014), there is a simple solution. He should start lobbying hard to force the European Central Bank to switch their money creation machine back on. But this time, instead of pumping up the financial markets, they should be putting that freshly created money directly into the pockets of Eurozone citizens. I am personally terrified that the forthcoming European Parliament elections will see a massive increase in the number of anti Europe candidates and parties. There is a real risk that the whole European Project will explode in mid flight. Macron has been trying to put himself forward as the person who could lead Europe (and indeed the world) out of the neoliberal quagmire that we are in. My proposal offers a way for Emmanuel Macron to do just that. If he did, he would satisfy the Gilet Jaune movement, and at the same time he would save Europe. Yes, I believe that he could do it. In principle, the whole "Grand National Debate" idea is precisely to allow French citizens like me to make novel and interesting suggestions. In one afternoon, I have provided a set of 5 such ideas. Emmanuel, if you want to talk with me about any of these ideas, I'm happy to come and talk with you about them. 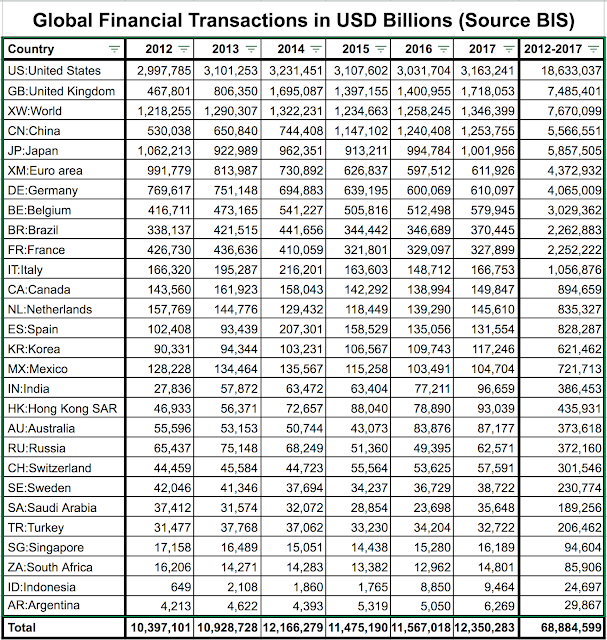 Earlier on today, I published my analysis of Global Financial Transactions using the latest figures from the Bank for International Settlements. It's also possible to pick out just the transactions that occured in France, as shown in the following table. The bottom line is that financial transactions have been running at close to $300 trillion a year in France for last 3 years. They actually went over $400 trillion in 2013, but $300 trillion a year is still a large number. 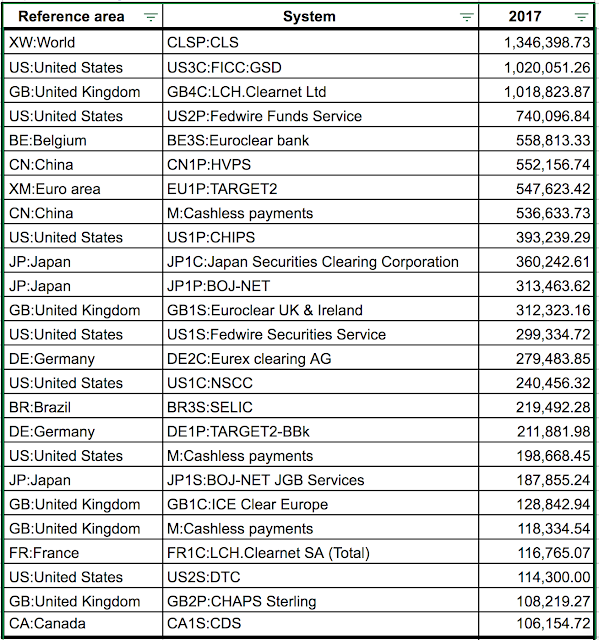 You can also see that the amounts being churned though the large payment systems like Euroclearn Target, Core and Clearnet France totally dwarf the levels of activity in the credit card system (less than a billion dollars), direct debits, credit transfers and cheques. It's really annoying that BIS no longer gives the numbers in Euros, but we can assume that $300 trillion is about €261 trillion. Now, anyone who has read my blog anytime since 2010 knows that I am a big fan of using a Financial Transaction Tax as a very good way to raise revenue. Imagine that Macron's government decided to impose a 0.03% tax on Financial Transactions in France. This would raise nearly €100 billion. Imagine what you could do with that? It's enough to provide an additional Basic Income of around €1600 a year - around €135 a month for every man woman and child in France - on top of the €600 provided by the 30% flat tax. That's starting to sound like a pretty decent level of income. Enough to allow many "Gilet Jaune" protestors to live decently. So, how much is President Macron prepared to do to satisfy the French population? Is he prepared to take on the Financial Markets who will no doubt say that a 0.03% tax on transactions will cause the sky to fall in etc. One of the main complaints about Macron's policies since taking power have concerned his moves that have favoured the rich. He suppressed the so-called ISF (Impot sur la fortune), and he is in the process of abolishing a whole range of property taxes. Both measures are felt by many to favour the wealthy, and there are mounting calls to reinstate some form of wealth tax. Like many people, I'm personally in favour of taxing the one thing that people cannot move out of the country. They can move their yachts, Rolls-Royces, paintings, statues etc offshore. But they can't move their chateaux, mansions, villas and estates. But, as usual, I'm reluctant to suggest schemes that appear to target specific classes of people or which require complex sets of rules. History has shown that attempts to target the wealthy with taxes that depend on the number of windows will simply lead people to block up the windows. My preference would be to have a flat rate annual tax that depends on the value of the property or land. Suppose that the annual tax was set at 1%. In that case, on a €200,000 property, the owner would be required to pay €2000 a year. For an agricultural estate you would use the current average value of agricultural land - currently €5990 per hectare in France, although the value depends a lot on the location. For example, in Southern Corsica, it's under €3000 but can reach €13000 in parts of the North. A really large 1000 hectare property might thus cost €10,000 a year, but since the average property in France is around 55 hectares, the amount due would be much less. The idea of taxing land has come under attack from people who quote the case of a farmer with land on the Ile de Ré, which, because it is a tourist area, became very valuable. Taxing the farmer on the value of the land would bankrupt him. But it seems to me that there is a simple solution. When the tax claim for 1% of the value of your property arrives, you would have a choice. Either you pay the sum in euros, or you effectively bequeath 1% of your property to the state. If, you lived on the land for 50 years without ever paying, 50% of your estate would belong to the state. And thus, when you die, and the property is passed on to your decendents, the State could asked to be paid. Again, the decendents could chose not to pay. But if they continued, the entire estate woud belong to the government. It seems a fairly simple system to me. Obviously, one could choose to have different tax rates for different types of property - with a higher rate for commercial property than residential or agricultural property. But, frankly, it seems to me that this is an unnecessary complication. Why not just have a flat rate (for example 1%) for everything? Clearly, you would need to have some way of deciding what the correct value is for each property. But it is estimated that the value of property in France exceeds €10,000 billion. If all that was taxed at 1% per annum, it would generate €100 billion a year - a substantial proportion of the entire French governments budget - currently around €385 billion. Admittedly, many people might be tempted to avoid paying the tax and progressively hand over the ownership to the Government. But, irrespectively of whether people pay cash or by granting the state rights, it is the French people that effectively become wealthier as a result. One particular case of interest is agricultural land. If a farmer was having difficulty in generating enough income to pay the property tax, it would be fine to hand over 1% of the land per year. That agricultural land could be loaned to citizens who could be required to use the land to cultivate fruit and vegetables or rear stock. It turns out that around 1000 m2 of land can be perfectly sufficient to feed a family of four. The only problem is that it requires a lot of manual work - roughly 6 hours a day according to my cousin Chris, who knows about these things. But with increasing automation, robotics and AI, many people will have much more time on their hands for such activities. And with around 28 million hectares of agricultural land in France, that is enough to allow 280 million families of four to be self sufficient! In other words, just transferring 1% of the agricultural land to common use could solve the food problem- and we would all be eating much more healthily! In my proposal for implementing a Basic Income using Negative Income Tax, I made the suggestion that children under 18 should not recieve the Basic Income directly. Instead, the parent or guardian would recieve a reduced rate payment for each child in their charge. I suggested that the payment could be 50% of the full adult payment - for example, €300 if the adult payment was €600. The question then arises of what to do with the remaining €300. In a post last year, I suggested that the remaining €300 could be put into a sort of personal fund that would become available when the child reached 18. With 18 years contribution at €300 a month, this would mean a total of €64,800. Now, that seems like a lot of money. But it's actually quite close to the amount of money required to provide 3 years of higher education. The actual cost of higher eduction in France is about €11,500 a year, which if you add in the living costs needed to study at university, means that it would mean that literally anyone reaching 18 could afford higher education - thus removing one of the major obstacles to social mobility. But my suggestion is that, if desired that €64,800 of funding could be used to finance a wide range of other projects - not just higher education. Some youngsters might like to use the funding to start up a business, or do several years of voluntary work, or maybe travel the world. By giving them the choice to do what they want, it would immediately increase the sense of belonging that is sadly lacking in a substantial proportion of French youth - particularly those living in deprived areas. Just imagine how much social impact it would have if a group of 18 year-olds in a deprived area had hundreds of thousands of euros of funding to do something within their local environment. Of course, I would not be in favour of just putting the money directly into the youngsters bank accounts. There would need to be safeguards to prevent misuse of the funds, and I think some sort of selection panel would be needed to approve the project. Nevertheless, I think that this idea could go a long way to instauring the social cohesion that is currently lacking. While I really like the idea, I have to confess that there are implementation problems that will need further thought. For example, it may not be reasonable to have the scheme start for everyone reaching 18 in a given year. It might be that the funding should depend on the number of years of residency in France. Emmanuel Macron's government in France has been shaken to the core by 9 weeks of protests by the so-called "Gilet Jaune" movement. Many French citizens are convinced that the whole system is rigged to favour the rich. Even François Holland, the previous French president, has said that Macron is not just the "Président des riches" - he is the "Président des TRES Riches" (the ultra rich). So, since this is a question that is very close to my heart, here are some of the proposals that are at the top of my list of suggestions. First, I am totally convinced that we need to introduce the idea of a Universal Basic Income. This idea was supported by Benoit Hamon, the Socialist Party's candidate at the 2016 presidential elections. However, his proposal was roundly criticised by people who complained that he failed to explain how it could be financed. However, my proposal is that it would be remarkably simple to introduce such a scheme if it was accompanied by a radical reform of the entire tax system. Specifically, I would argue that we need to have a Negative Income Tax for people below a certain level of income. It's actually an old idea that was touted by someone who could hardly be described as a rabid left-winger. Negative Income Tax was seriously proposed by Milton Friedman - see for example his presentation in 1968 - and the idea very nearly got implemented by Richard Nixon! The idea is really very simple. You provide a basic payment to every adult with absolutely no conditions attached. After that, everyone would be required to pay tax at a fixed rate on all additional income. Two numbers need to be fixed - the level of basic income, and the rate of taxation. But, my calculations have shown that the following numbers work nicely in France (see my post in May 2017 for more details). With a basic income set at €600 a month and a flat rate tax on additional income set at the very same rate as the one that Macron's government imposed on all unearned income (dividends, sales of shares rents, etc), namely 30%, it turns out that the whole system actually pays for itself. With €600 as the basic income, you would have to earn €2000 a month to reach a level where the tax you pay (30% of €2000, or €600) cancels out the basic income payment. Thus anyone earning under €2000 will actually receive a net payment from the tax system - essentially negative income tax. The distribution of pay in France means that this would apply to around 61% of the population. Median income is actually around €1700, meaning that half the population earn less that this amount. Now, if you do the calculations (for the details see this earlier post), it turns out that the amount of tax that would be paid by the 39% of the population earning over €2000 is almost exactly the amount needed to pay for all the negative tax payments for those earning less. In other words, the income tax system would simply function to redistribute income from those earning large amounts to those earning less. Intesestingly, even though the flat tax rate of 30% sounds like it could not be progressive, in fact it is. Someone earning €3000 a month would pay €300 in net tax - a rate of 10%. At €4000 a month, ne tax would be €600 (effectively 15%). At €6000 a month, net tax would be €1200 (i.e 20%). This tax curve is actually very similar to the one in existence already, but it is way simpler to understand. I suspect that many French people would much prefer such a system. At the same time as introducing the Basic Income payment, it would also be possible to scrap the hundreds and thousands of complex loop holes that make declaring taxes in France such a complex process. Indeed, it might be possible to virtually eliminate the need for filling in tax forms! France has literally just switched to a "pay as you earn" tax scheme where tax is deducted at the moment you recieve your salary. The timing is perfect, because it will soon be possible to ask for all income tax to be paid at the flat rate on all income - both from salaries and from financial income. This will immediately remove one of the major complaints about Macron's government - the fact that rich people only pay 30% tax on their unearned investment income, whereas people who actually work for their money end up paying 45%. The same rate would apply for everything. Simplification of the Child Benefits system and other Benefits. Inroducing a Univeral Basic Income via a Negative Income Tax is also a way to enormously simplify the current French Benefits systems. There are currently a large number of different benefits that are available to French citizens. But many of them are complex and involve some form of means testing. For example, until recently every parent or guardian recieved a fixed child allowance for each child (although the amount varied with the number of children). However, it was recently decided to make the payments depend on level of income - households earning more than a certain amount are no longer able to claim the full amount. Such complexities could easily be avoided by giving the parents and guardians the equivalent of a Basic Income for each child in their charge, using the same negative tax mechanism mentioned earlier. The amount of Basic Income could be less than the full adult amount. For example, it might be set at €300 instead of the €600 paid to those over 18, meaning that a family of four would start with a Basic Income of €1800 and would only start paying net tax if they earned more than €6000 a month. Similar mechanisms could be used to replace the existing benefits for other types of situations. For example, people who are disabled and are unable to work to earn money, or require additional care, could be given an increased Basic Income to compensate. That amount could reach €2000 or more in the case of people with severe problems. The Basic Income could also be used to effecively replace the existing minimum payments to pensioners. For a single person, this is currently €868,20 for a single person, meaning that replacing it with the Basic Income would require a bit more than the €600 value used in my earlier calculations. But the amount for a couple with no resources is currently €1347.88 per month, which is actually quite close. Of course those minimum payments are currently for people with no other resources. With the proposed scheme, they would simply pay the standard 30% flat tax rate on other sources of income, such as private pensions and other unearned income. The result would be much simpler that the current system that requires a complex procedure to prove that the person is truly with no other resources. Some will no doubt complain that giving money to people who are not necessarilly working is a bad idea - it would be better to provide money specifically to people in work. Indeed, the French Government often provides specific benefits to people on very low wages. For employers, this is actually an encouragement to keep their workers on low wages, because under such conditions, a larger percentage of their salary costs is effectively covered by payments from taxpayers. I know people who work just 80% of the time, because if they worked a full five day week, their income would exceed some threshold that means that they lose some of their benefits. Such poverty traps would be eliminated by the proposed change - you would always keep precisely 70% of any additional income, irrespective of your level of earnings. But consider the effect of giving the Basic Income to everyone - including all those in work, at all levels of the salary scale. This means that, as far as the employer was concerned, the French Taxpayers is effectively providing a boost for all their employees - not just those at the bottom of the payscale. This is actually very close to providing a taxpayer subsidy for producing goods and services in France! To see why, imagine that you are a company that wants to build cars and you are trying to decide where to do it. Yes, you could do it in somewhere like Marocco where wages are lower. But you might also decide to do it in France where a worker with a family of four is effectively getting a €1800 a month subsidy from the government. Essentially, it's very like the situation with other universal benefits that are provided to people working in France like free education, health care, inexpensive public transport and so forth. Every one of those benefits effectively acts as a hidden subsidy for production in France - in a way that is almost as direct as the tens of billions of aid currently provided to French industry in the form of tax breaks. In fact, it amazes me that apparently noone in the pro-business lobby in the US seems to have cottoned on to the fact that the US's hugely inefficient Health system is totally disastrous for US business. All those inflated health care costs are paid by employers who have to pay their staff way more than in countries with a more sane system. These proposals for a Basic Income make good sense for many other reasons. I am totally convinced that the AI and automation revolution is going to mean that many people will lose their jobs and be unable to find enough paid work to cover their living costs and the costs of raising their families. Some people naively believe that as millions of jobs disappear as autonomous vehicles become the norm, new paid jobs are going to appear out of thin air to compensate. I think this is totally delusional. It is far more likely that the total amount of paid work will gradually decrease. Currently, the average worker in France works 1510 hours a year, but there are around 10% of people who are unemployed. With around 25.5 million in work, that makes around 38.5 billion hours a year. Suppose that, over the next decade or two, the number of hours of paid employmet drops by 50% because of automation and robotics so that there is only 19 billion hours of work. There are obviously various ways that this reduction in the number of hours could be implemented. One scenario would uniformly reduce the standard working week by 50% so that the 25 million people currently working just work for 18 hours a week, instead of 35 hours. But this doesn't seem particularly intelligent. Why not let those who want to work and earn lots of additional money do so? They would simply pay 30% tax on all their additional income. Others might like to reduce the amount of time they spend doing paid work to that average 18h value. This might involve working just 3 days a week, or just mornings, for example. The rest of the time they could decide to get involved in really important activities like caring for loved ones (children and elderly relatives), voluntary work, or they could get involved in cultural activities such as theatre, music, literrature and so forth. Yet other people might choose to abandon paid work completely. They might move to the country, buy a plot of land, grow their own food, and make their own furniture. In fact, in an ideal system, each citizen would choose precisely want they want to do in terms of paid work and decide precisely when they do it. Yes, they might decide to work all year round. But they might also like to work just one week a month, or a couple of months a year. There would be no such thing as unemployment. The only thing that would change would be the amount of time that people decide to spend doing paid work. That would be a question of personal choice, and could very across each persons lifespan. Some could effectively retire early. Others would keep going if they so desired. Let me note one final radical effet of this sort of Basic Income scheme. Currently the most unpleasant jobs are often very badly paid. Since people have no choice (they have to do something to pay the bills), the most unpleasant jobs are often done by people who have no alternative. But in a system where there are real alternatives because people really can go an live in a remote rural place and live with essentially just their basic income, nobody would accept the crappy jobs unless they were sufficiently well paid. Unblocking sewers and garbage collection would suddenly become very well paid! I hope that this first presentation will get some people interested. I very much hope that the French Governments "Grand Debat National" will indeed be an opportunity to try out some truly radical new ideas. We certainly do need people to start thinking out of the box. 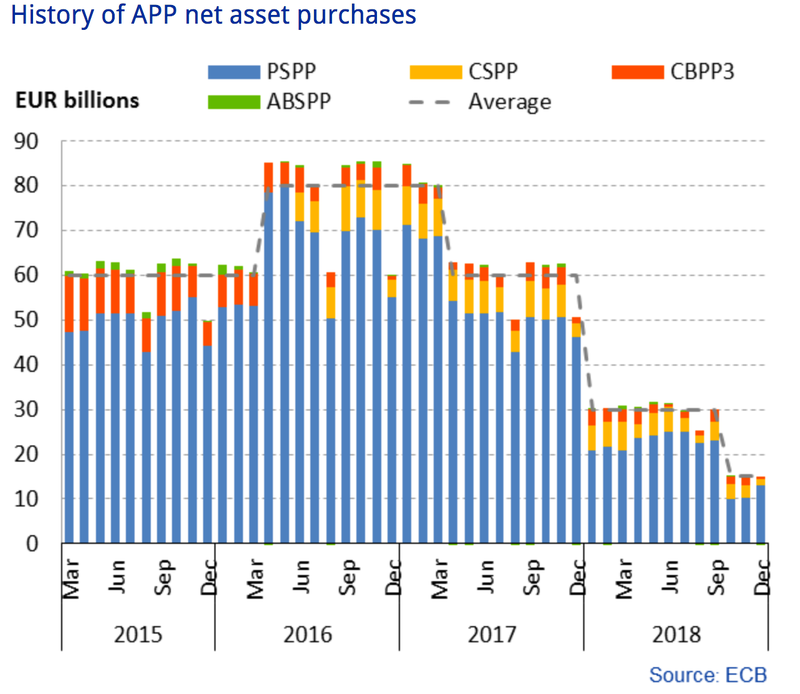 On 13 December 2018, the Governing Council of the European Central Bank (ECB) decided to end net purchases under its Asset Purchase Program that started in March 2015. Their website provides useful graphics that show how this system has worked. 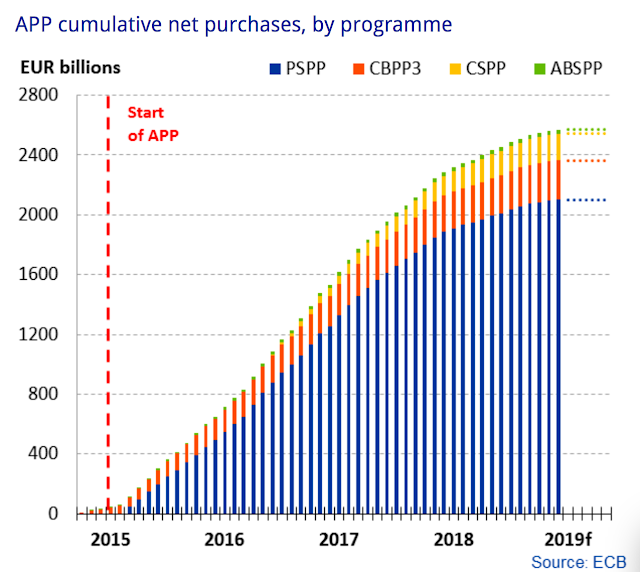 First, here's a graph showing how the Bank's net purchases have increased over that period to reach a final total of €2,569,817,000,000. The precise details of how much money creation was allowed per month can be seen in this graph. As you can see, the ECB was buying up assets at around €60 billion every month during the period, though the numbers peaked at around €85 billion in 2016 before tapering off at the end of 2018. 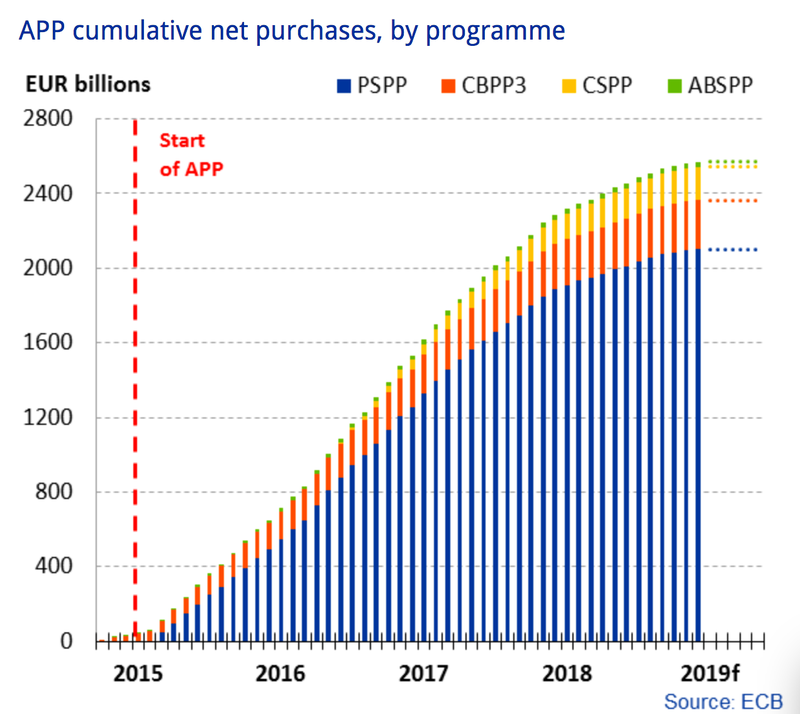 The ECB effectively created €2.57 trillion out of thin air, and used it to support the financial markets by buying up assets (private sector securities and public sector securities). This almost certainly made a lot of rich people a lot richer, and thus will have increased levels of inequality between a priveledged elite and the rest of the population. The claim was that this was necessary to keep inflation at the optimal 2% level, imposed by the European Union. If you look at the figures for the Eurozone Inflation rate since 2009 (data courtesy of the Trading Economics Website), I suppose that they could argue hat they succeeded. Inflation did indeed increase from around 0% in 2014-2015 to over 2% from June to October 2018. Mind you, it has slipped back to 1.6% more recently. However, was pumping €2.57 trillion into the financial markets the best way of achieving the aim of achieving 2% inflation? What would have been the problem if the money had been directly injected into the pockets of Eurozone Citizens? According to the latest figures, there are 341,464,266 people living in the Eurozone. A simple calculation shows that the ECB's money tree could have provided cash payments of €7526 for every man, woman and child in the Eurozone. That's over €30,000 for a family of four. Would putting money into the pockets of citizens have been such a terrible idea? Would it have caused runaway inflation? I doubt it. The vast majority of households in the Eurozone are massively in debt. It depends on the country, but average levels of debt as a percentage of net disposable income vary between 48% in Latvia, to over 100% in Spain, France, Portugal and Finland. But the record is in the Netherlands, where debt levels average 242% of disposable income. If a €30000 handout per family had just allowed people to get at least partially out of debt, surely the effect on the economy would have been far more useful than boosting prices of shares? Writing off debt does not cause inflation. But it does mean that Banks can no longer charge so much in interest payments. In many countries in Europe, citizens are sick and tired of living in a system that is clearly rigged to favour the rich and the superrich. France's "Gilet Jaune" movement is the perfect example. And the risk is that, if we keep on with the current system where important players like the ECB are run by ex-Goldman Sachs bankers like Mario Draghi, there will be a lot of people voting for extreme groups in the forthcoming European Elections. Is it too late to change course? I hope not. Now that the European Central Bank has revealed the well hidden fact that Central Banks are perfectly capable of creating essentially unlimited amounts of money out of thin air, isn't it time for Citizens to say that enough is enough? We want that money creation power to be used for something that is actually useful for all citizens - and not just for the 1%. Since I started this blog in 2010, one of my main obsessions has been to try and get the best information I can about the level of Global Financial Transactions - because I'm convinced that taxing global financial transactions is one of the best ways to fix the world's economic system and reduce the inequality that is threatening our very existence. One of the best sources I have found is the Basle based Bank for International Settlements. In the past, they provided data in the form of downloadable Excel files or pdf documents that I would use to compile figures for the previous year. For example, here are my original posts going back over several years. 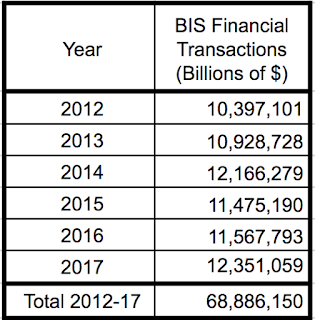 BIS Financial Transactions in 2016 - Over $11 quadrillion - again. Last year, the BIS threw me a bit because they changed the way they present the data. Now, it's all done with interactive webpages and while on the face of it, this may seem more convenient, for me it required a bit of time to get used to it. Table PS3 gives the value of transactions for a set of selected payments systems in billions of US dollars. Table CSD3 gives the value of delivery instructions processed by selected central securities deposiories. A few other tables provide some other figures. For example Table CT7 gives the value of cashless payments, and Table CT8 gives the same numbers, but broken down according to the type of instrument (Credit transfers, Direct Debits, Cheques, Card and e-money payments, and other instruments). Table CT11 gives the value of withdrawals and deposits. But these tables all give values in millions of US dollars. I've uploaded all the relevant figures into a Google Sheet that can be viewed here. It provides figures for the six years from 2012 till 2017. The bottom line is as follows. 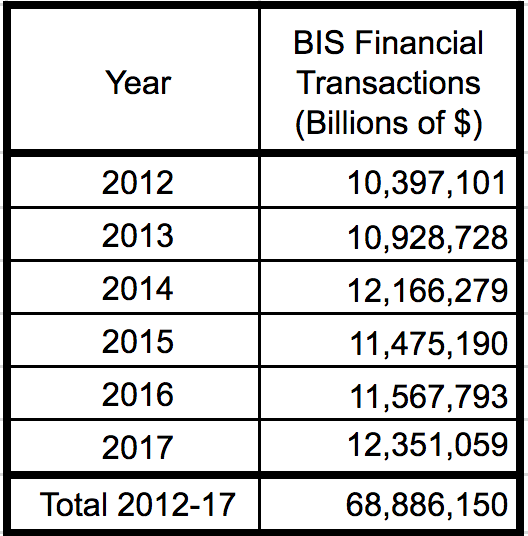 Total transactions for 2017 add up to 12,351,059 billion dollars (let's call that $12.35 quadrillion) - an increase of 6.8% on 2016. If we look at the full six year period from 2012-7, we a total of nearly €69 quadrillion. The BIS's interactive website doesn't let you recover data before 2012, but see my earlier posts for the relevant data. There are nearly 250 different entries in the full table, but we can get an idea of the biggest players by just showing the ones accounting for the largest amounts. The table below gives all the players that handled more than $100 trillion each. The biggest of them all is global clearing house CLS which handled over $1,346 trillion dollars worth of transactions in 2017. It's interesting that BIS doesn't even locate CLS in a particular place - it's location is "The world". Number 2 is the Government Securities Division of the Fixed Income Clearing Corporation in the US (FICC) where transactions totalled $1,020 trillion. 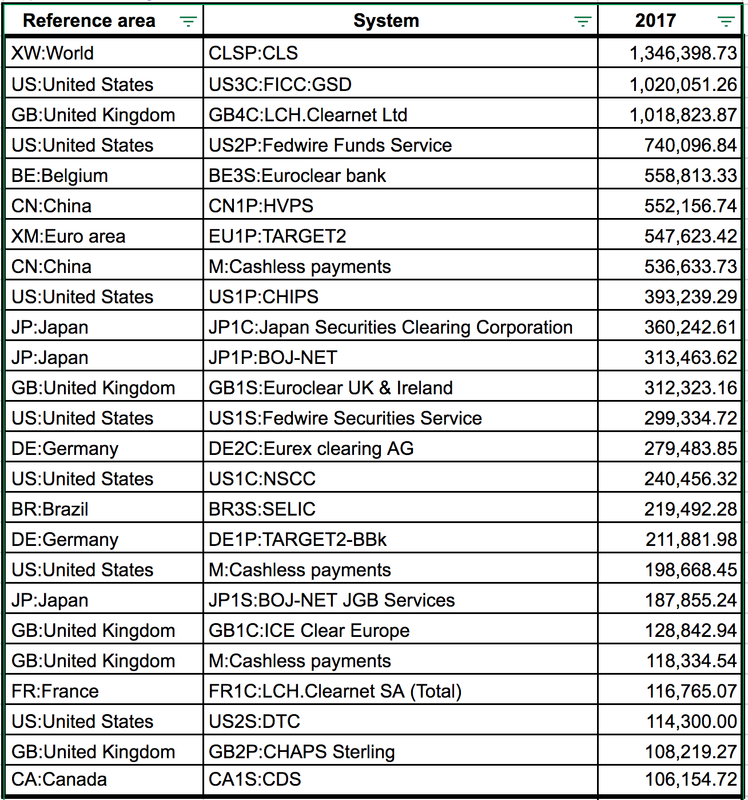 The UK based LCH.Clearnet is yet another player that handled over 1 quadrillion dollars worth of trades. We can also break down the transactions by country, as shown in the following table. The USA is clearly at the top, with a total of $3.16 quadrillion, but the UK has increased its activity considerably with nearly $1.72 quadrillion in 2017 - up 22.6% on 2016, despite Brexit fears. China and Japan are also both in the quadrillion dollar group. Relative to the BIS's previous analysis, it is worth noticing that there have been a couple of significant changes. Firstly, there are some new countries that were not present before. For example, Indonesia and Argentina were not included in previous years, but the BIS has provided reasonably complete data for both countries since 2012. On the other hand, it is apparently the case that BIS is no longer offering data in Local Currency Units. Only values converted to US dollars are provided. This is, I think, a real shame because changes in a particular country's level of transactions could simply be the result of changes in the exchange rate. If someone from BIS reads my blog (you never know!) can we please have the option of getting the data in local currency units too? The other major problem is that the BIS's figures are clearly incomplete. The most glaring omission is the absence of the Chicago based Options Clearing Corporation. This major player cleared a staggering 5.24 billion contracts in 2018 - 22.6% up on the previous year. Apparently, the Bank for International Settlements hasn't heard of them. It is not clear to me how much those 5.24 billion contracts are worth, but OCC does reveal that in 2018, the premiums associated with Equity options trading (which accounts for 2.56 billion trades) totalled over $852 billion, compared with only $492 billion in 2017. For Index/Other Options, the premiums on 564 million trades exceeded $1042 billion, again massively increased on 2017 when the premiums were less than $555 billion. If someone can let me know how to calculate the value of a transaction based on the premium, I would be very interested. Frankly, OCC alone could be handling more financial transactions than the rest of the financial system combined. Isn't it about time that someone (other than an amateur economist working from home) took these questions seriously? The issue of the true value of financial transactions could become very important. I've been proposing that a global financial transaction tax of just 0.1% could generate enough revenue to provide a Universal Basic Income at half the median local income for every person on the planet. To get that figure, I assumed a figure of $11 quadrillion. But, the latest BIS figures show that the number I was uising is at least 10% less than the current value. With the missing OCC figures, the potential for a global FTT to provide a universal basic income becomes even more obvious. But I'm still here, and still convinced that entire financial system that controls the world in which we live needs a complete overhaul. 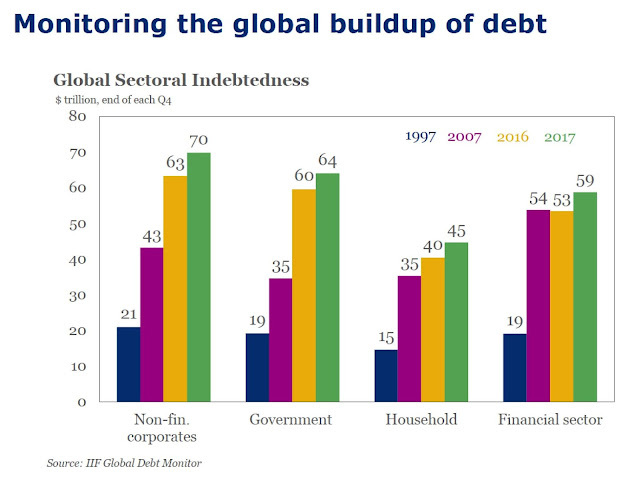 In the latest edition of their Global Debt Monitor from July 2018 they state that "Global debt rose by over $8 trillion in Q1 2018 to over $247 trillion (318% of GDP)". Very frustratingly, the Institute for International Finance's full reports are only available to "Members". It's not enough to have an account with a login - I've created an account with them, but that's not enough. No, to access the full reports, you have to belong to an organisation that is a Member of the IIF. Now, I am a Research Director at the CNRS - Centre National de la Recherche Scientifique - France's biggest public research organisation. It has 33,000 full time staff, 1144 laboratories, and a budget of €3.3 billion. But it turns out that the CNRS is not a member of the IIF, and so I have no way of getting hold of the full report. I suspect that the cost of membership is so high, that it's really only Banks and Financial Institutions that can afford it. Enough moaning. Let's take the IIF's $247 trillion figure at face value. The question is, where is all this debt coming from? Who has a huge pile of trillions of dollars that they can lend out? Are we borrowing the money from some super rich person somewhere? No. Even if you take the wealth of the 10 richest people on the planet, you only get a total of about $744 billion - not even a trillion. So, even if they were to lend out everything they own, you would not be able to explain how we can have so much debt. For people who have been following my blog over the last 8 years, I hope you know the answer. Nobody had the money that was lent out. It is just created out of thin air when commercial banks make loans. There is no fixed amount of money that can be lent. Money is just created by increasing the amount of global debt whenever a commercial bank can find someone prepared to take out a loan, and sign up to paying interest on that debt. True, there has been a recent tendency of some Central Banks to commit the ultimate sin and create money out of thin air themselves - just like the commercial banks. They were not supposed to do that, because it made it glaringly obvious that money really can be created out of thin air. Contrary to David Cameron's claim, there is indeed such a thing as a "Magic Money Tree". For example, the European Central Bank, under the leadership of ex-Goldman Sachs director Mario Draghi, has purchased a total of €2,532,098,000,000 (2.5 trillion) in assets since March 2015 using "money" that they didn't have. That succesfully made a lot of people very rich by boosting the markets. But the amount of credit generated by the ECB only accounts for a very small percentage of the $39 trillion increase in Global Debt that we have seen since 2015. The vast majority of the extra debt is due to the operation of the banking sector, which has been creating more and more debt by getting Corporations, Govenments and Households to take on the vast proportion of the extra debt. You can see this in this figure from the Insitute's Powerpoint presentation. Since the financial crisis in 2007, debt has increased by €80 trillion. Of this, €27 trillion (34%) was taken on by corporations, €29 trillion (36%)was taken on by our goverments, $10 trillion (12.5%) by households, and just €5 trillion (6%), by the financial sector. Thus, the financial sector has really succeeded in finding a bunch of suckers to take on their debt. 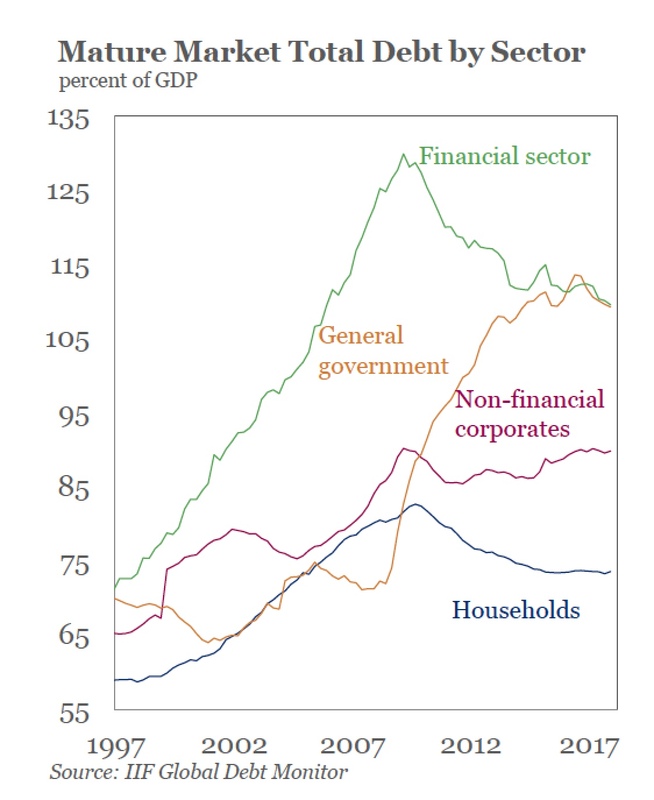 This is particular obvious when you take the IIF's graph of debt as a percentage of GDP for Mature Markets (i.e. not the developing markets). 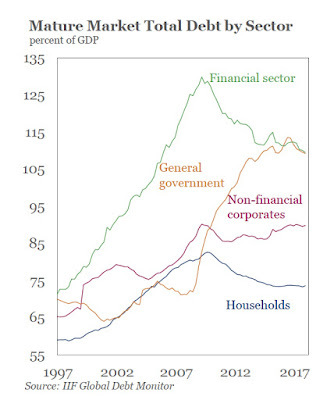 Just look at how the financial sector's debt level dropped, while government debt soared. OK. So let's just take that figure of $247 trillion and consider what that means in terms of interest payments. Let's be generous and assume that the banks who managed to get corporations, governments and households to take on that debt, are only charging 2% interest on the loans. That's still around $5 trillion per year that is being moved to the people who have their hands on the debt creation machine. World GDP is currently about €75 trillion. So that means that at least 7% of the entire global economy gets siphoned off in interest payments. and total interest payments on public sector debt for the period 1995-2017 was over €7.8 trillion. Remakably, that figure is exactly the same number as the increase in debt over the same period. Yes, all the increase in European public sector debt was entirely used to pay interest. So much for governments spending too much on health, education, social services etc. In the US, the latest figures show that taxpayers paid a staggering $523 billion in interest payments on public sector debt in fiscal year 2018. The total paid since 1988 has reached over $11.2 trillion. And with Trump cutting taxes for Corporations and the wealthy, the level of debt, which has already reached $21.5 trillion in September 2018, will continue to soar - and the interest payments will go up even more. But the figure of 2% that I usedfor the interest rate, while reasonable for the current cost of government debt, is not realistic for the rest of the economy. For example, if you borrow money using a credit card, you willl be lucky to pay less than 13% in the US, and if you are a student, you may get charged over 22%. But interest rates in the UK are particularly eye watering. Check out the list of cards here and you will learn that there are companies that will happily charge you 39.95%. In France, where I have the fortune of living, extortion like this is illegal - interest rates are limited currently to 3.73% per quarter. But the rule is pretty simple. Banks will charge as much interest as they can get away with - it's their duty to their shareholders to maximise profits. Actually no. I've been working on a scheme called IOUNet that I hope will mean that, someday, we will be able to live our lives without the banks "money". There will be no need to continuously pay interest to the banks that somehow succeeding in convincing us all that the only way to run an economy is using a debt based money system. At that point, we could just ignore the €247 trillion of global debt. After all, once you realize that the whole thing is just a scam, all that debt will be seen as just pieces of paper - or rather, lots of zeros in some computer. The latest figures for European Goverment Debt at the end of 2017 were published by Eurostat on the 23rd of April. You can download the data yourselves if you like from their site, but I've put the key figures on a publicly available Google Sheet Doc here. 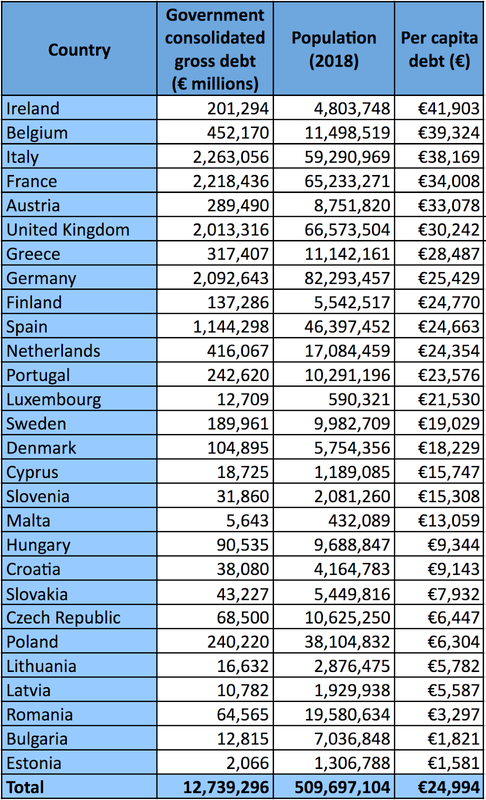 The bottom line is that the governments of Europe now owe €12,739,296,000,000 (let's call that $12.7 trillion). The table below gives the debt levels by country. Four countries stand out by having each over €2 trillion in debt (Italy, France, Germany and the UK). But in some ways this mainly reflects the fact that these four are the four largest countries. I've therefore generated a second table, using the latest population figures for 2018. that allows me to calculate per capita debt, as shown in the following table. Interesting to see that Greece comes in 7th position, only just slightly higher than Germany. 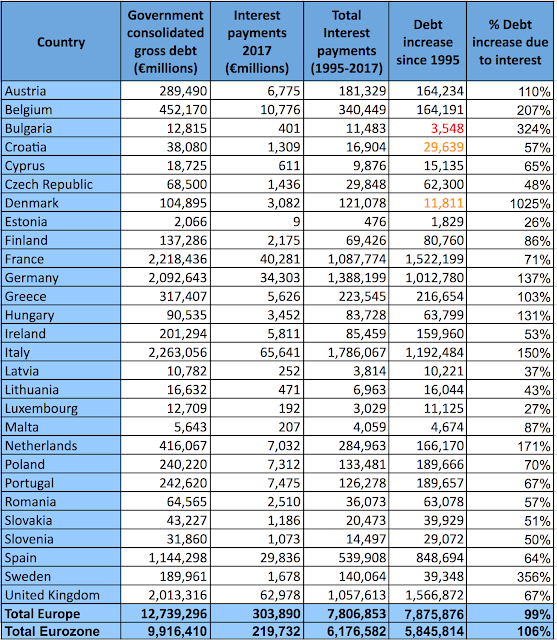 The other fascinating set of data that Eurostat has just made available concerns the interest payments on public sector debt for 2017. I've compiled all the data into one large table and included some information about the total interest payments since 1995, as well as how the level of debt has increased over the same period. The final column shows the percentage of the increase in debt due simply to interest charges. 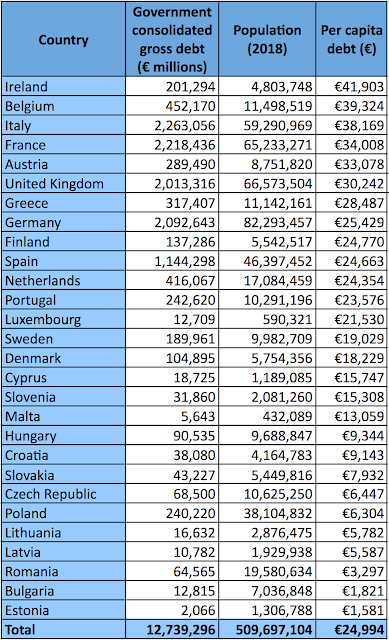 Here, the bottom line is that European Union taxpayers effectively paid a total of nearly €304 billion in interest payments in 2017. I suppose that we should be grateful that this number has been dropping gradually over the past few years (it peaked at €366 billion in 2013). However, it is still an incredibly drain on all our governments. The fact is that the total amount of interest payments since 1995 comes to an eye-watering €7.81 trillion. This figure is slightly underestimated because the figures from Eurostat are not complete - those for Bulgaria only started in 1997, and for Croatia and Denmark the numbers only start in 2000 (I've indicated this in the table by using red and orange text). What I find so impressive is that this number is almost exactly the same as the amount that government debt has increased over the same period, namely €7.88 trillion. 101% per of all the increase in debt is explained by those interest payments. My conclusion? 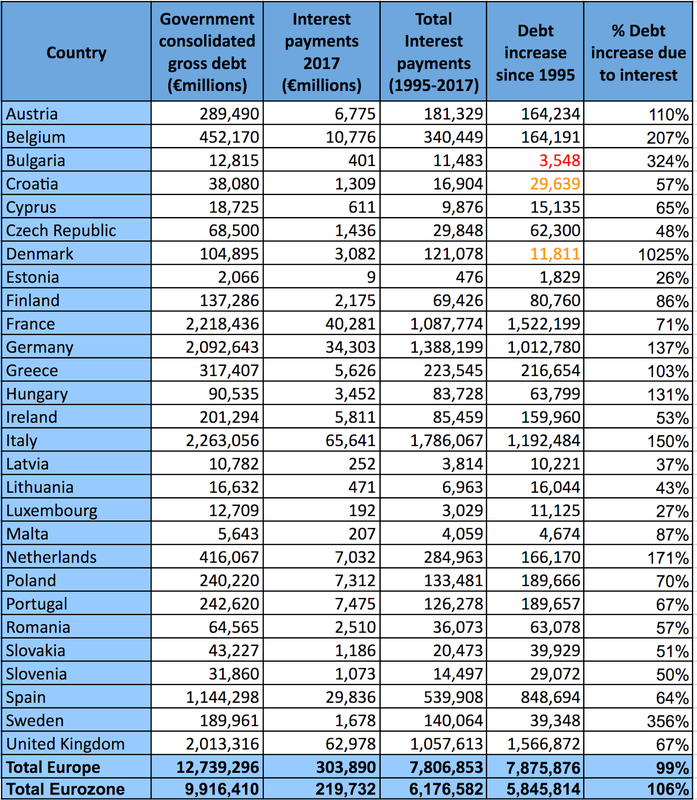 The so called European debt crisis is not because Governments have been spending too much on things like Education, Social Security, Health, Transport, Defense etc. The debt mountain is due to the stupid and unjustifiable interest payments that our governments are forced to pay to the banking sector and its allies. Cut off those payments, and our governments could function normally without going into debt. The story is pretty much the same if we just talk about the 19 Eurozone countries. Here again, interest payments since 1995 have reached €6.18 trillion. That more than accounts for the increase in public sector debt. Methinks it is time to change the system. If we do decide to give an Unconditional Basic Income of €600 to all adults, we need to decide what to do for those who are under 18. My suggestion is that we might pay half the sum (€300) to the parent(s) or guardian, and put the other €300 into a fund that would become available to finance personal projects on reaching the age of 18. Logically, this would amount to an impressive total of €64,800, which, when multiplied by the number of people reaching 18 in a given year (818 939 for 2017), adds up to a very large sum - over €53 billion. How on earth could the French government possible afford such an amount? In this post I would like to propose another radical reform which would effectively allow the state to finance the higher education system. It currently costs €11 510 a year to put a student through higher education in France. That's around €35000 for the 3 years needed to get a Licence (roughly the equivalent of a Bachelors degree), and €57500 to study for the 5 years needed to obtain a Masters degree. Currently, essentially all the costs of providing University training in France are paid for directly by the state. Students only have to pay a very modest amount - €184 for a Licence (first 3 years of University), or €256 for a Masters (years 4 and 5). That is only around 1.5% of the actual costs. 77% of French youngsters currently get the Baccalaureat qualification which entitles them to attend University. And many of them do, with the result that the first years of university are often overloaded with students who might not really be convinced that university is for them - but at €184 a year, it is a good deal. But imagine what would happen if the Universities were to charge the true cost of the teaching (€11 510) and that this could be paid by the students using their €64 800. Everyone would thus be able to go to University if they wanted. But they would know that they are using their precious savings, and that they also have the choice of using the money for something else if they wanted. They could, for example use the money to start up a business, either individually, or by getting together with a group of friends. I suspect that the percentage of youngsters going into higher eduction simply because is is an easy option could drop considerably - easing the pressure on the universities. They might also choose to use the money to help them pay for somewhere to live. France is a country where there are still many rural areas where €64 800 can be enough to buy a modest house for cash. Thus, young people would have a real choice at the start of their adult lives. Education, or starting a business, or starting a home. That sounds quite an attractive option to me. The other effect would be to encourage those who finally decide to go to university to make a go of it. Currently, many students are only poorly motivated and end up retaking one or more years, with the result that it can take several years of study to get a degree that should normally be obtained after just 3 years. My guess is that such a shift from a higher education system which is provided for almost nothing to one where students pay the real cost, but where the state provides the money needed to cover the costs, could radically improve the efficiency of the system. And I would note that this proposal is much better than the one that is currently used in the UK. Students studying at University in the UK are effectively paying close to the full cost of their eduction via a £9250 annual fee charged by the vast majority of Universities. But the only real choice for students in the UK is to borrow the money, meaning that by the time they have got their degree, they can easily have run up debts of £50 000 or more. Indeed, total student debt in the UK has now reached a staggering £100 billion. With my proposed scheme, you would be able to fund universities without anyone having to run up debt at all. There is another interesting effect that might be obtained by introducing such a scheme. Currently, there a large numbers of young French people living in relatively deprived areas in the suburbs who are essentially disaffected and disatisfied with the society that they live in. Such people are often easy targets for radicalisation, and may end up joining a Jihad in Syria, for example. Offering them all a substantial starter pack on their 18th birthday could be precisely what is needed to avoid such problems. In my recent posts, I have suggested that we could provide all adults in France with an Unconditional Basic Income of €600 a month and pay for the entire system with a flat rate tax on all additional earned income of 30%. I also suggested that it would be good to provide those under 18 with a €300 monthly payment that would be paid to the parent(s) or guardian. But I didn't provide the details of how that could be financed within the context of my Negative Tax proposal. Indeed, my original calculations didn't include the cost of payments to under 18s. So, let's look at the numbers. The latest official figures puts the total number inhabitants in France at 67.2 million, of whom 14.8 million (22%) are under 18. Providing a €300 basic income for each of them would cost €4.434 billion a month. How might this paid? One option would be to increase the flat tax from 30% to 34%. This would indeed allow all adults to receive a €600 a month, and those under 18 to get haf that amount - namely, €300. Relative to my original proposal, where 61% of the population receive something from the tax system (paid by the 39% who earn the most), the new figures mean that only 53% of the population would get a net payment from the system, paid for by the 47% that earn the most. Of course, this particular set of numbers is pretty arbitrary. For example, if we decide to stick with the 30% flat tax rate (rather than 34%), the system could be made to balance by reducing the basic income for adults from €600 down to €529 (and sticking with the principle that under 18s would get half the adult value, i.e. €264.5 par mois). It's up to us to decide the level of Basic Income and flat tax that we want. Indeed, the French government has already voted to impose a flat tax of 30% on all income from capital (interest payments, dividends etc). Unfortunately, I have not yet been able to determine how much revenu this change will produce, but it would seem to me to be perfectly reasonable to unify these different sources of revenue. In other words, revenue should be taxed at the same rate whether it is income from paid work, or from capital investments. It is highly probably that such a more would produce enough revenue to allow both the €300 for under 18s, and €600 for adults to be financed. Following my recent talks and presentations, I've been getting a number of questions about the details of my proposal for implementing a basic income in France via a radical reform of the tax system. The basic idea is shown in this figure. The blue curve shows the income distribution for people aged 18 and above (extracted from a table provided by Landais, Piketty & Saez). It shows that about 10% of the French population have virtually income at all (apart from welfare payments). The curve increases roughly linearly up until about the 75th percentile, before shooting up. Roughly 2% earn more than €10000 a month, and I didn't plot the graph above that point to keep things in scale. 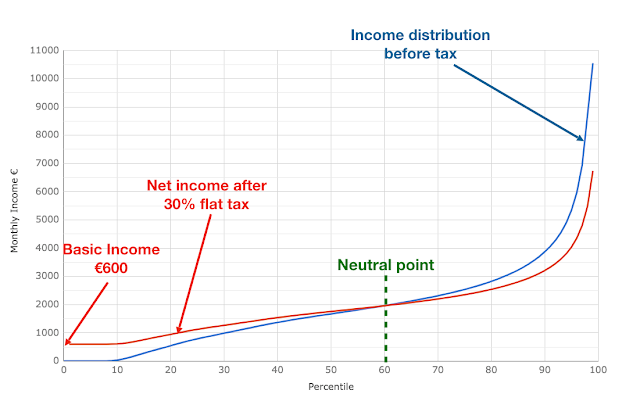 The red curve shows what people's income would be with a Basic Income set at €600, and a flat tax of 30% on all earned income. I note that the French government recently voted to impose a flat tax on all income from capital (rents, dividends etc). So really, all I am proposing is to extend the same principle to all forms of income, including salaries. The green line is the neutral point that occurs when someone is earning €2000 a month. At that point the €600 of basic income is cancelled out by the need to pay €600 (i.e. 30% of €2000) in tax. The 61% of the French adult population who earn under €2000 a month would thus receive a net payment from the tax system - effectively a negative tax. Amazingly, by choosing the numbers in this way, I was able to set things up so that the money needed to make those payments is provided by the tax paid by the 39% earning more than €2000 a month. In other words, the Basic Income can be financed with no additional input. Indeed, the income tax system becomes a purely redistributive mechanism - channelling money from the 39% who earn the most to the 61% who earn the least. Is the Negative Tax system progressive? Despite being based on a 30% flat rate of tax, it really is a progressive tax. Someone earning nothing will get the basic €600. That seeems to me to be a very progressive tax scheme with no need for arbitrary tax bands. Indeed, it's actually pretty close to the current situation where less than half of the French population pay income tax, and where the effective tax rates rarely go above 20-30% except for very high earners. Furthermore, that person earning €10000 a month will know that their tax cut of €2400 would be directled exclusively to people earning less than €2000, but with a much larger share going to those right at the bottom. They would be able to look themselves in the mirror and know that they were doing something directly to help those less fortunate. It might encourage them to pay their taxes normally like the rest of the population, rather than attempting to hide their wealth in tax havens. 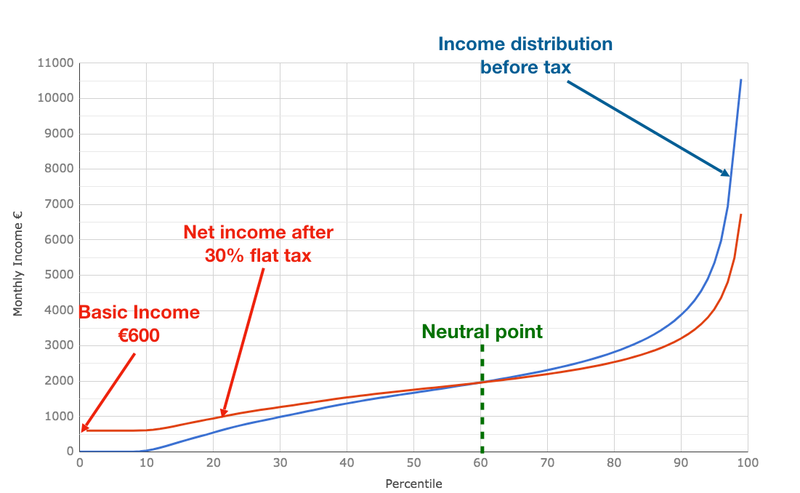 In addition, those at the top end of the scale would be paying a marginal tax rate of 30% that is in fact lower than what they currently have to pay - 45% in France. In other words, everyone is better off. Who would vote to keep the current system? Would there be a Basic Income for under 18s? Many people want to know what I think should happen for those under 18. While I think that you could have a smaller amount (say €300), my preference would be to keep the same number but to divide the Basic Income into two parts. One part would be given to whoever was legally responsible for the child. The other part could be put into a sort of savings account that would allow the child to have a sizable pot of money when they reach 18, a pot that could be used for a wide range of projects including paying for higher education, other forms of training, setting up a business, travelling or indeed any other activity that could be justified. I would probably want to prevent young people from simply cashing in and spending everything on a drink and drug splurge. Let's take a simple case where the €600 is divided into two equal parts - €300 for the parents or guardians, and €300 for the savings scheme (other splits are of course possible). The part for the parents and guardians would only be provided to people who were prepared to commit to providing the basic necessities for the child's welfare. All children would need to have a predefined set of things that might include at least 2 pairs of shoes, underwear, trousers, shirts, jumpers and rainproof clothing. Any parent or guardian who did not meet those minimum requirements would no longer receive the money. In such cases, the money would be diverted to someone else (a relative, friend or a foster parent, for example) who was prepared to take responsibility for the child's wellbeing. Making the payments conditional in this way would, I believe, avoid the temptation to have excessive numbers of children to simply increase revenue. Anyone who did that would know that there was a serious chance of losing that revenue later on, if they failed to behave responsibly. Normally, for a child with two parents, the €300 would be split between the two parents. But in the case where there was a separation and one parent only looked after the child for part of the time, the allowance could be split to reflect that amount of time that each parent was looking after the child. Single parents would of course receive the full sum for each child in their care. You could even have a situation where a child was living in a community with several adults (not just parents) who could share the funding between them. They would simply need to agree on the way the money was split for such variants on the standard two parent model to work. What about the €300 a month put into a savings account? At €300 a month over 18 years, this would add up to a total of €64800 - enough to pay for a university education for those who want it. Or to help launch a business project. In principle, young people would have to wait for 18 years to be able to get the full amount. And one year after the introduction of the scheme, someone reaching 18 would only get 12 times €300, i.e. €3600. However, personally, I would be in favour of opening the scheme up straight away, so that all youngsters would be able to count on a large sum from day one. I really think that much of the divisions in society and the problems in the suburbs could be reduced by convincing young person that they really do have a stake in society and that, effectively, the rest of society really does want them to be able to make a success of their lives. Sure, with around 800,000 people reaching 18 every year, this would cost a lot - around €50 billion, to be precise. But it might be worth it. The alternative, of course, is to reduce the €300 sum reserved for the savings pot to a more affordable amount. What would happen to other welfare payments? It seems to me clear that if there was,a radical reform of the taxation system that allowed everyone over 18 to have a basic income of €600 (€300 for under 18s), it might be possible to get rid of a significant proportion of the current mechanims. This issue is clearly critical. If the Basic Income was used to get rid of all the current social security system, it could be viewed as a very right wing liberal agenda aimed at rolling back the role of the state. On the other hand, if the Basic Income was only used to replace benefits that were clearly redundant, it really could be just thought of as a useful simplification of what is currently a very unwieldy and complex system. The fact is that the take up of many of the exisiting benefits is often poor. In many cases, potential claimants are simply unaware that they are entitled to receive the payments. In other cases, they may know about the scheme, but find the administration too daunting. Rolling benefits into a single Basic Income could thus have very beneficial effects by avoiding such problems and making sure that everyone gets treated in the same way. So, let me be more specific. I have looked carefully at the range of welfare payments that currently exist in France with an aim to choosing those ones which could reasonably be dropped following the introduction of a Negative Taxation based Basic Income scheme. In all, there are some 75 different types of State aid schemes in France, that together cost close to €600 billion. You can find my analysis in a public Google Sheet file here. Over three quarters of the nearly €600 billion budget goes on Pensions and Health care, and I think that we can safely ignore this expenditure as being something that cannot be replaced by the Basic Income payments. When people have contributed to a Pensions scheme, they have a right to expect that they will get the pension they saved for. Likewise, payments for health care are, at least for me, something that should not be covered by a basic income. I am definitely not proposing a system like the one proposed in Trump's America, where individuals have to finance their own health care plans. On the other hand, many of the other types of welfare payments could perhaps be integrated into the Unconditional Basic Income via a reform of the tax system. For example, many of the payments made to those with disabilities (totalling nearly €20 billion) could be integrated into a Basic Income scheme by simply having a higher Basic Income than the standard €600 a month for anyone unable to work. For example, currently €8.6 billion a year is paid to the roughly 1 million people eligible for the AAH (Allocations aux adultes handicapés). That works out at an average of around €700 a month. By increasing the Basic Income from €600 to €1300, this could allow those payments to be made withnin the same system. A further €1.5 billion is spent on PCH (Prestation de Compensation du Handicap) and ACTP (Allocation Compensatrice tierce personne) payments for people under 60 years old. These payments, made to around 250,000 people, work out at about €527 a month. Again, providing a larger Basic Income for such people would be a simple way to include such payments in a reformed system. Similar arrangements could be used to compensate people with other disability payemenst such as the ASI (Allocation supplémentaire d'invalidité) which pays about €265 a month to about 78,000 people, and the SSIAD (Service de soins infirmiers à domicile) that pays an average of €120 a month to about 212,000 people. However, there are a number of other payments that could reasonably be dropped and replaced by the standard Basic Income. These include the Allocation Familiale (AF) which costs €12.8 billion and involves payments to over 5 million people, which averages aound €213 a month. Over 3.1 million people also receive an allocation de rentrée scolaire, costing nearly €2 billion a year and amounting to about €50 a month. These numbers are below the proposed €300 a month for looking after children under 18. There is another scheme called the Prestation d'acceuil pour Jeune Enfant, which has various forms. The basic version costs over €4 billion a year, and is paid to over 1.8 million people, which averages €188 a month. There's a PAJE "Complement d'activité" costing €5.7 billion a year, paid out to 455,000 people and is about €151 a year. Note however, that there is another PAJE - "assistante maternelle" that costs €5.7 billion, is paid to 750000 people and costs an average of €638 per month per person. It may be that to cover such costs, it might be necessary to increase the Basic Income payment to people with young children to compensate. But I note that there is another solution. Why not simply subsidise the creche system and make direct payments to the creche rather than making payments to parents, who then need to pay the creche? A similar solution may already be in place in the case of the "Acceuil des jeunes enfant (creches)", that costs over €5 billion a year. The state also spends a lot to provide people with help to get into work, with benefits like the ARCE (Aide à la reprise ou à la création d'entreprise) costing €612 million. The Allocation d'aide au retour à l'emploie (ARE), costing nearly €29 billion a year, involves payments to nearly 2.5 million people. This works out at around €970 a month on average - above the proposed €600 a month proposed here. So it may be that a complement would be needed to prevent such people losing out. Other benefits are aimed at reducing extreme poverty. They include the RSA (revenu de solidarité active), costing over €10 billion a year and paid to 1.9 million people (an average of around €450 a month), and the RSA activité, costing €2 billion a year and paid to 915,000 people (an average of €194 a month). Over 5 million households receive the PPE (Prime pour l'Emploi), which costs over €2.1 billion a year, and provides an average of €34 a month. Substantial sums are involved in pension payments. For example over €20 billion a years is spent on special payments for retired people who were not paid a salary, and around €3 billion for the so-called Minimum Vieillesse - a sort of basic income for the retired. But overall, if we take the 60 or so different payment mechanisms currently in place that are not related to pensions or health, there is a total of around €169 billion in payments that could potentially be integrated into a Basic Income scheme that involved a fundamental rewrite of the tax system. It seems almost incredible. How is it possible to cover much of the costs of these benefits using a reform to the tax system that is itself self-financing? Actually, when you think about it, in makes sense. The current version of the income tax system currenty provides money for the government. The amount it provides is pretty close to the numbers I have been talking about here (for example, income tax provided around €146 billion in revenue for the French goverment in 2010). By reworking the whole system, we have simply diverted that same amount of money into peoples' pockets without having a separate tax and welfare system. In a nutshell, we would have shifted from a system where Income tax provides around €170 billion a year that effectively gets used to finance the benefits system, to one where the Income tax system provides no actual revenue for the state, but where the requirements of the welfare system are covered by the negative tax mechanism. The ultimate question thus becomes whether voters would actually want to keep the current extremely complex tax system with multiple tax bands with hundreds of tax loops, and an equally complex benefits system that many people in need can't use because it is too complicated for them, or switch to a very simple streamlined reformed tax system where everything, including benefits, are all done with a single system that everyone can understand. There are, in fact, a whole host of reasons why a Universal Basic Income would be a great idea. My analysis of how it could be implemented in France suggests that there is essentially no reason for not going for it. And the sooner the better. I've been very quiet for a few months. But actually, there's been a lot going on. Last Thursday (15th February), I gave a TEDx talk in Toulouse (in French) entitled "Survivre à la révolution de l'Intelligence Artificielle". Here's a link to the event, and the Youtube version should be coming out soon (I hope). I gave examples of the new chips that are coming out that only cost about $10, and which can do trillions of calculations per second on very low power devices (under 1 watt) that are only about 7 mm across. I predict that such devices are going to make it possible to automate many of the jobs that people currently do to make a living. The consequences will be catastrophic - IF we continue with the current economic model where everyone is supposed to be able to earn enough to live on. But there's a simple solution - a Universal Basic Income. And in my talk, I detailed three different ways that would allow such a system to be introduced. In other posts, I will and answer some of the questions I have been asked about the details of the proposal. The COP23 meeting is currently running in Bonn. Among the main questions - how can we raise the $100 billion a year that is needed to combat climate change, especially since Trump's decision to effectively pull out of the deal. There's an incredibly simple solution. 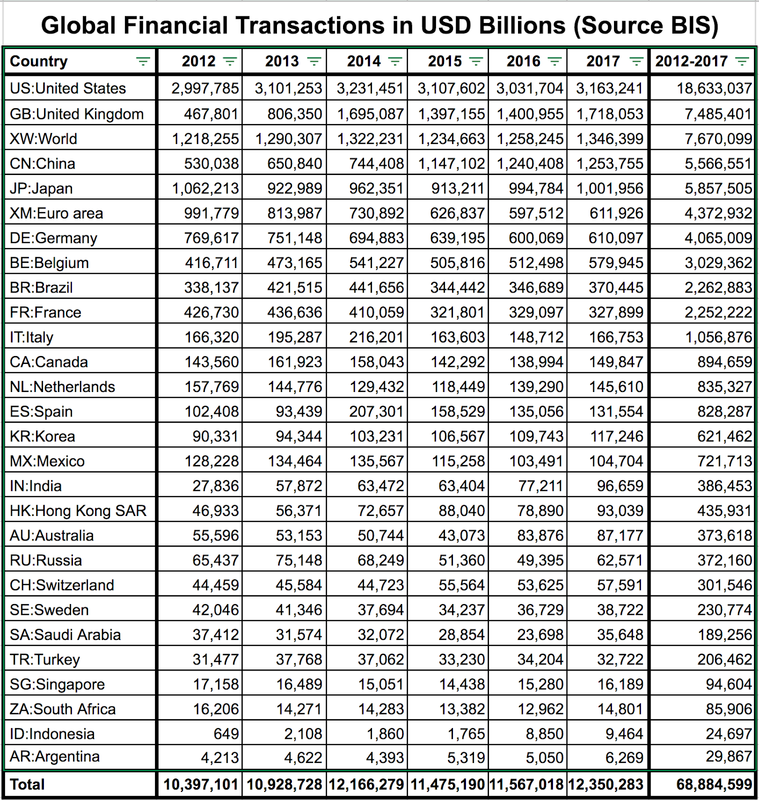 As I documented recently, global financial transactions in 2016 totalled over $11 quadrillion - that's 100,000 times more than the amount needed. And that $11 quadrillion figure has been exceeded in 4 of the last 10 years, despite the financial crisis. It follows that an absolutely minuscule tax of 0.001% would finance the whole thing, without the need for governments to chip in directly using taxpayers money. Everyone on the planet would be contributing, in proportion to their financial resources. I see another huge advantage in the current situation where the recently released Paradise Papers have revealled the true extent of tax evasion. The UN should simply impose the 0.001% tax on absolutely every transaction, wherever it occurs. Apart from providing the funds necessary to fund the fight against climate change, it would mean that anyone attempting to hide their financial activities could be commiting a criminal offence. The UN should have prisons for anyone who attempts to cheat the system by making undeclared financial transactions. The only transactions that could escape such a tax would be payments in cash. But it would be easy to phase out cash as a means of payment. Even in Africa, people are getting used to using mobile phones for banking. It's been a long time since I last posted a Youtube video. Here's a new one that could interest readers of my blog. It's a modified version of a talk I first gave at the EmTech (Emerging Technology) meeting in Toulouse France, on the 10th of October 2017. For the first time, I managed to talk about my two passions in the same talk - my interest in brain-inspired computation, and my interest in economic reform. Essentially, I argue that $10 chips with Neural Computing algorithms will be replacing humans in many paid jobs. The resulting transformation in society will lead to a catastrophy if we continue with the current system. However, solutions already exist. I claim that we need a Universal Basic Income, and suggest three perfectly valid ways to implement such a system. These are (a) using negative income tax, (b) using Central Bank Money Creation, and (c) imposing a tiny Financial Transaction Tax on all electronic transactions. Interestingly, it looks there are more and more people who think that the Robotics revolution is going to result in many people losing their jobs in the coming years. Well known science broadcaster James Burke was on BBC radio a couple of days ago saying that 90% of jobs will disappear in the next 30 years. And to my delight, he also said that he thinks that a Universal Basic Income could be the solution. You can find the broadcast here. James' presentation starts after 51 minutes. Here's another table that analyses where the financial tranasactions listed by the Bank for International Settlements have been taking place since 2016. You can again find the data on a google sheet file here. The US remains the biggest player, followed by the UK, although the international CLS settlement system comes close at number 3 in 2016..
By looking at how the transactions in different countries have changed, you can see some very dramatic changes over time. The most striking change has been China, where transactions have increased from just under $134 trillion in 2006 to over $1.14 quadrillion in 2016, putting it at the number 3 slot. Germany has now dropped back to a mere $638 trillion in 2016 from a peak of $1.46 quadrillion in 2013. It has thus dropped behind Japan. From my point of view, the fact that transactions can move around like that doesn't really change my basic conclusion. If we decided to impose a Global Transaction Tax, it would be be possible to provide a Basic Income at 50% of median income for every person on the planet with a tax of just 0.1%. The money is clearly there, it just doesn't get used to do the most important things for the planet. And, as I have said over and over again, even the $11 quadrillion a year reported by BIS is almost certainly massively underestimated becauses the mammoth Options Clearing Corporation doesn't even get listed. So you might not even need to tax at 0.1%. You might say that there would always be some place where people would try to provide a tax haven to allow traders to get away without paying even 0.1%. There are solutions for that too. You simply have to decide that any financial transaction that is not declared is not legally valid. I suspect that even the most greedy traders would be happy to pay 0.1% of the transaction value to ensure that their billion dollar deal was legally valid.